Home Reno Challenge: turn this ugly bathroom beautiful, bright, clean and comfortable on a budget. That sink has to go. The floor needs a lot of work. That awful dirty yellow paint is atrocious. I'm excited. I can't wait to get the job done! Looking at possibilities for design. I have to work around that green tub and the green toilet. Exploring ideas. Should I go with a bold print for a wall design? Should I keep it simple and safe? Will it be easy on the eyes? Hmmmm. I love this project. Floor work: Next challenge: What floor should I go with? what paint swatch should I use to guide my overall design. Lots of planning, exploring, imagining… all part of the project. 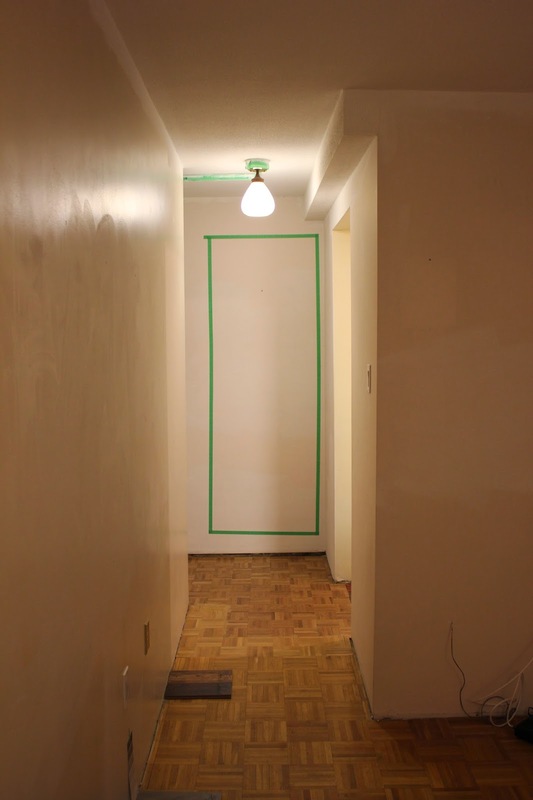 I'm thinking maybe a mirror about that size can go into that spot I marked with a green painter's tape. Baseboard and flooring finally decided on. This will be the basis of my design.